Giving technology demos can be nerve wracking — and one often feels, at the point of demoing, that one is at the mercy of inscrutable, capricious, and even cruel higher powers who may or may not let you do your job. This is especially true when it comes to demoing voice. Wearing your lucky socks and carrying a rabbit’s foot never hurts, but what can sometimes help is to be as prepared as you can humanly be. Below are some tips we have picked up along the way and that we are sharing to hopefully make the lives of fellow mortals a little bit less stressful. Please feel free to send us any tips that you want to share, or feedback on the content below. We would love to hear from you (use the form below to reach us). Those who have demoed Alexa/Assistant/Cortana on Far Field know what we mean. The most frustrating part of demoing Far Field speakers is connecting them to the Wifi. There are a million reasons, it seems, why the connection won’t happen. Don’t make ANY assumptions about what kind of Wifi you will have: there may be NO Wifi, or there may be Wifi, but it follows some funky protocol that your device doesn’t understand, or the Wifi may be weak, or spotty, or it needs a password and no one knows it. Get to wherever you are demoing early, and the first order of business should be for you to hook up your device to the Wifi, and to keep monitoring that the Wifi is up and stable. By turning on The Audio Request Sounds, you will hear Alexa make a noise when she begins listening to you and a noise when she stops listening to you. This helps ensure that you don’t start speaking before Alexa starts listening, or that you do not continue speaking after Alexa has stopped listening. 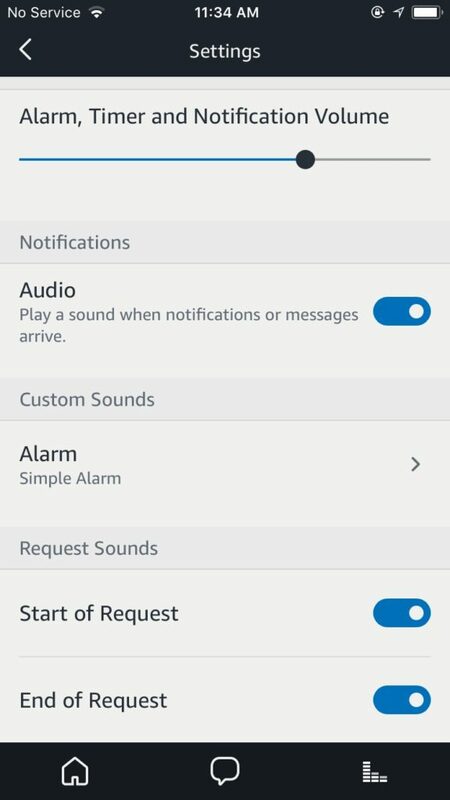 To do this, in your Alexa App, go to: Settings -> [Pick you device] -> Sounds. You should see the screen below. Switch on the “Start of Request” and “End of Request” options. If you have more than one Echo device around and they are close to each other, use a different wake word for each, that way, you don’t trigger both as you are addressing one. For best results, use “Alexa” or “Computer”. The other possible wake words are “Echo” and “Amazon”. We recommend against “Echo” because the signal on the word is too weak and will result in false wake ups if the Echo device is on, while we advise against “Amazon” because, for some reason, the wake word rubs people the wrong way and distracts from the experience. 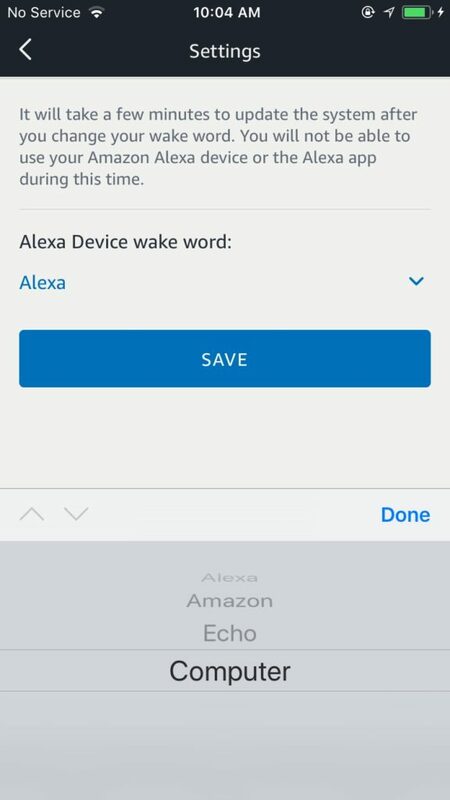 To selects your wake word, in your Alexa App, go to: Settings -> [Pick your device] -> Wake Word. You should see the screen below. If you are in a noisy environment (say an expo floor) or in an environment where you will be mentioning the assistant’s wake word (in a meeting where people may say, “Alexa,” “Ok Google,” “Hey Cortana”), make sure that you mute the devices. Know how to use your skill/action without any printouts or other visual aids (like having the script on your phone). You can have such visuals to help you prepare, but don’t demo while looking at a cheat sheet or your smartphone. It makes you look lazy and the skill will come across as complex, since it needs instructions to use! Yikes! Often, when Alexa/Assistant/Cortana doesn’t understand something, users repeat what they said by speaking unnaturally: slowly or loudly. This usually doesn’t help (in fact, it makes things worse). Instead, you should speak in a normal voice and at a natural volume. Color me blind. What can I do you for? I can guess your favorite color, tell you what my favorite color is, or give you the name of a color that I bet you don’t know. USER: Guess what my favorite color is. ALEXA: It’s Yellow. Bingo! Right? USER: Alexa, Guess what my favorite color is. NOTE: (a) Since Alexa/Assistant/Cortana cannot be interrupted without using the wake word, make sure that you use the wake word to have it start listening, (b) above best practice is also good to follow when the user base of your skill is mainly power users who know what to say when. The challenge is to have a long enough pause for the power user to speak without speaking over Alexa, but not too long that it confuses the first time or infrequent user (i.e., they don’t know what to say). Voice Assistants can’t tolerate more than 1.5 seconds of silence between spoken words in the incoming speech they are listening to and will interpret the gap as an end of speech event (you have stopped talking). So, know your demo and speak naturally and avoid long pauses. Never improvise or show off while demo-ing. Pick a path in the flow, make sure that it works, test it several times, and then during the demo traverse it exactly as you had tested it. The demo is supposed to show something working and to get you to move along the conversation to talk about next steps. Don’t let your impulse to show off tech come in the way of doing business. If for whatever reason the skill/action fails, be honest about why it failed. Don’t lie (for instance, accuse the cloud service of being down, or the Wifi signal of being weak). If it’s too noisy, then say that it’s too noisy. If the skill/action was not designed for a use case, say that this is a demo and that you deviated from the path. Just come clean. Your audience will respect the honesty. If for some reason the Wifi is down, or the internet is down, or the middleware is down, or the cloud service itself is down, or the device fell down and is now broken, etc., have a backup plan. A good back up is a video that you have downloaded to your laptop or your smartphone that shows the skill/action in action. PS: have the video both on Youtube/Vimeo as well as on your laptop/smartphone locally, that way, if the internet connection is not good or is down, you can still show the video. Remove all prompts that explicitly talk about failure, such as: “I’m sorry, I didn’t understand that” or, “Sorry, I didn’t hear you.” Use a double beep, instead, which will cue you to speak again (and could be interpreted by your audience as a failure on your end rather than the technology’s). Make sure you don’t have the skill/action speak for more than 10 seconds (at the very most) without giving the turn back to you. People (especially people visiting an expo booth, for instance) are impatient with voice demos. Short 3-5 seconds of the assistant speaking is ideal. You are going after quick interactions, creating an impression, painting a vision, making a point, so that you can move the conversation between you and the prospect right along. A fan or a heater that vibrates, especially if it’s nearby, will throw off the Far Field speaker’s microphones. Make sure your speakers are not near any such vibrating devices. Mind also vibrations that are not tied to a specific device. Construction that is far off and whose noise you can’t hear, but that is resulting in ambient vibration, will be picked up and will disrupt the microphones. Keep your antenna up for such vibrations/tremors. Corners mess up your Far Field speaker’s ability to capture audio: audio bouncing off the wall corners distorts the audio signal. Similarly, don’t put it in front of say a large screen, or anything that obstructs its field of hearing. Put the speaker in an open space, where there is nothing that obstructs it. Test the skill/action with the same equipment that you will use in the demo. If you will be demoing the Google Action on a Google Mini, test it on a Google Mini not the larger Google Home. If you will be demoing on an Echo, don’t test it on a Dot or a Show. Test the skill/action in the same environment (room, expo floor, auditorium, etc.) where you will do the demo. Ambient acoustics can make a big difference, even if your ears can’t tell.